I know that the title of this recipe is a conflict of terms. Is it grilled or is it baked? Essentially it is a baked potato, just like a baked potato out of your oven. We're just 'baking' them on a grill. Why would we do that? Well, sometimes I want a baked potato with my grilled steak and don't want to heat up the oven, that's why! Not to mention the fact that potatoes on the grill come out perfectly fluffy on the inside and a little crispy on the outside, just the way I like 'em. 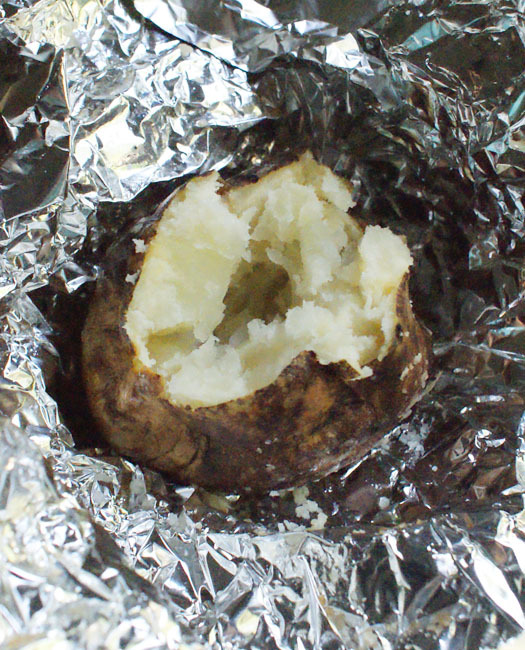 Tear off square pieces of aluminum foil for however many potatoes you have and place the potatoes onto the foil. Pierce your potatoes with a fork or knife a few times. Drizzle olive oil over them and sprinkle with kosher salt (Use as much as you like. I'm a salt-aholic, so I use a LOT of salt.) Wrap 'em up in the foil. Heat your grill to medium heat. Place the potatoes on your grill (the top rack, if you've got one) and cook for 45 minutes to 1 hour (depending on the size of your potatoes), flipping once halfway through the cooking time. 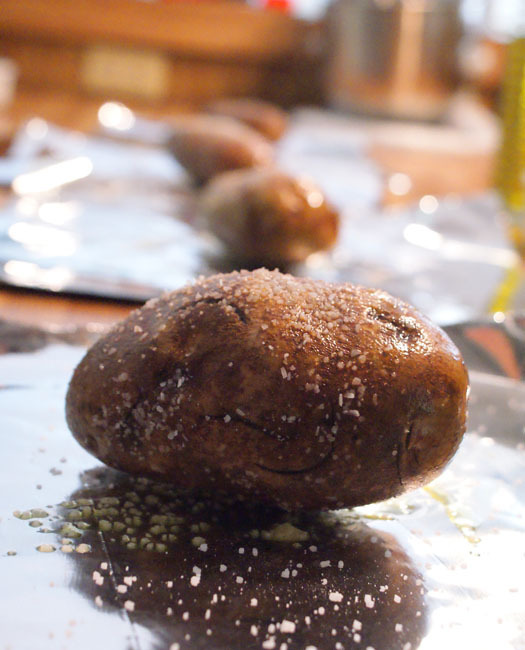 Unwrap and top with your favorite baked potato toppings! I always throw and extra potato on the grill to cut up and fry for breakfast in the morning!